I had to research a lot about this biryani, and finally, YouTube videos helped me. Deg in Hindi means big vessels or boiler, and Deg biryani refers to the biryani made in big pots. I think “Deg” biryani became degi biryani. We all know that there is a red chili powder variety called Degi Mirch, but I am not sure if it is named after that. But, this biryani is spicer when compared to the other biryanis as it uses pickle spices. 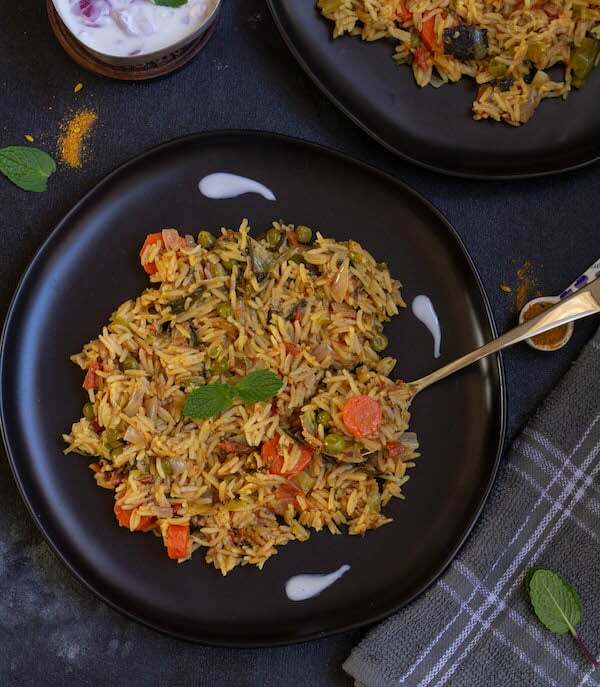 We use the parboiled basmati rice called sela basmati or golde sela rice for this recipe. It is very firm and grainy. The rice doesn’t become mushy but takes a lot of time for absorbing the flavors. Like parboiled rice, parboiled basmati also has its unique taste. 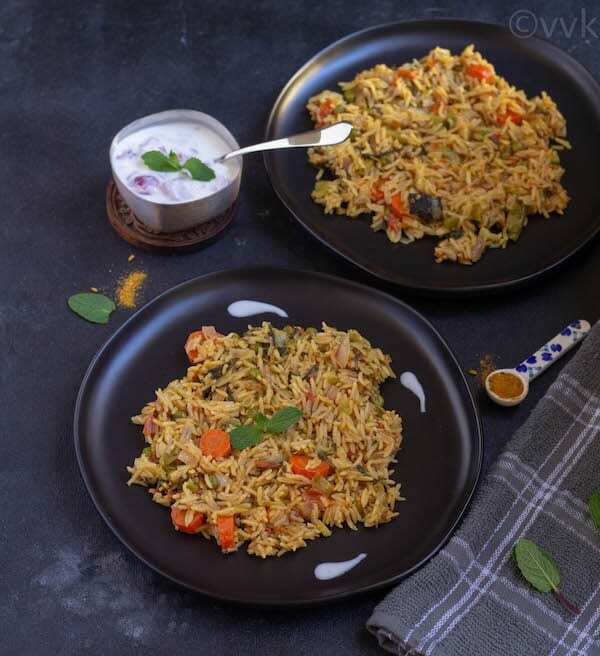 Along with the biryani spices, we add pickle or pickle spices for this biryani. Most of the recipes call for green chili pickle, and they add it during the DUM process. Instead of green chili pickle, you can use mixed vegetable pickle or Achari Ghost masala like me. 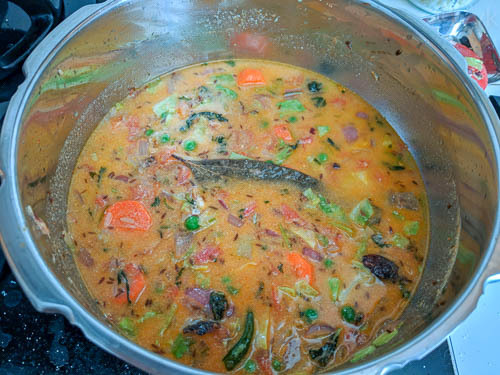 I got the idea of including cabbage and achari ghost masala from this video. 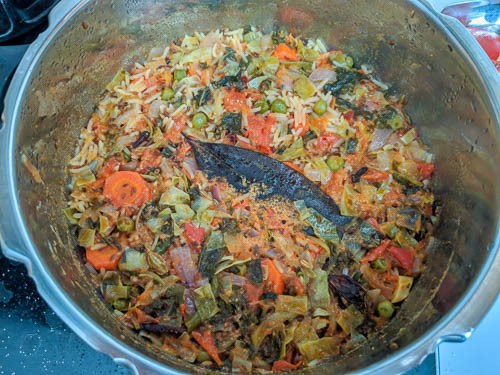 Luckily, I was able to source the achari ghost masala (I used the Shan brand, and the masala is entirely vegetarian) and I used it instead of pickles. But I increased the oil quantity though. And I made this biryani in the stove-top pressure cooker like my Bhatkal biryani and even though I soaked the rice, cooked the rice for one whistle so that the rice can absorb the flavors. The rice is firm, and it stays grainy even if you cook for two whistles. That’s one thing that I like about this sela basmati rice. 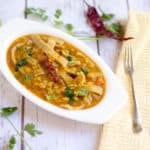 If you are using Instant Pot, you can cook this rice for 7 minutes in high pressure and release the pressure after 3 minutes or cook for 4 to 5 minutes and release the pressure naturally. So now without any further ado, here comes the spicy Delhi veg biryani that I made in the pressure cooker. Chop all the required vegetables and set aside. Wash and soak the sela basmati rice for atleast 20 minutes but not more than 30 minutes. 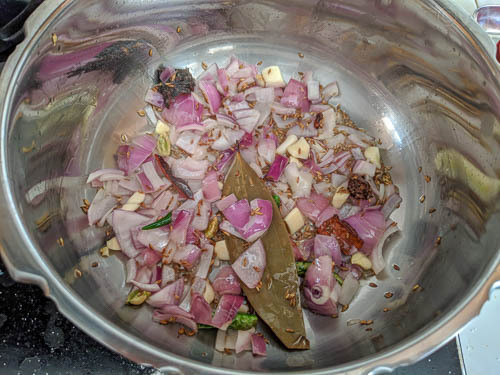 When the oil is hot, add cumin seeds, bay leaf, cinnamon, black cardamom, green cardamom, and cloves — Fry for 30 seconds. Add the chopped onion, green chili, and ginger. Saute until the onion turns translucent. 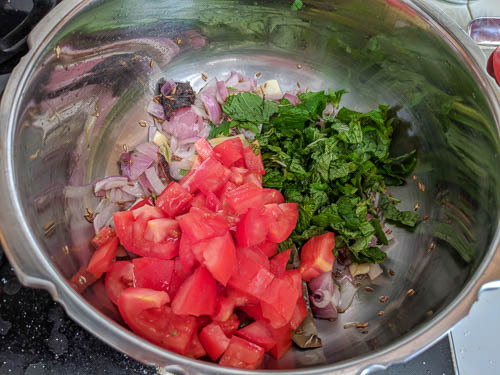 Then add the tomatoes, mint leaves and cilantro. Cook for about 3 to 4 minutes or until the mint leaves wilt. 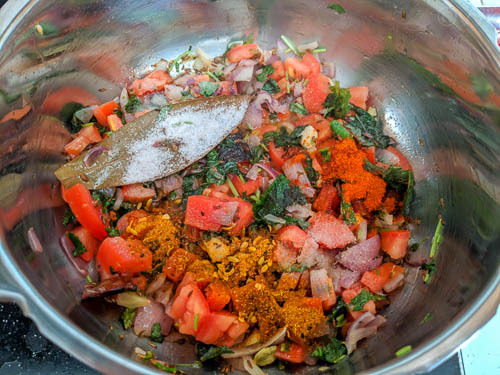 Now add all the spices including salt, turmeric powder, red chili powder, and achari ghost masala. Mix and cook for about two to three minutes. 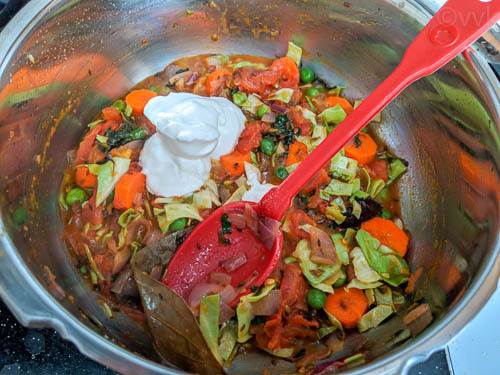 Add all the vegetables – cabbage, carrot, and peas. Then add the yogurt and kewra essence. Now add the rice and water and mix thoroughly. Close the pressure cooker and put the weight on and cook for one whistle. Allow the pressure to release naturally and open the lid. Let the biryani to cool for 5 minutes and fluff it with a fork. 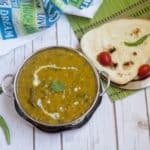 Serve hot with raita. Adjust salt and spice according to your preference. Instead of sela basmati rice, you can use regular basmati rice as well. 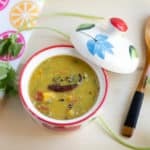 If you have green chili or mixed vegetable pickle, then add a tbsp of the pickle instead of achari masala. Also, reduce the amount of oil to 3 tbsps. 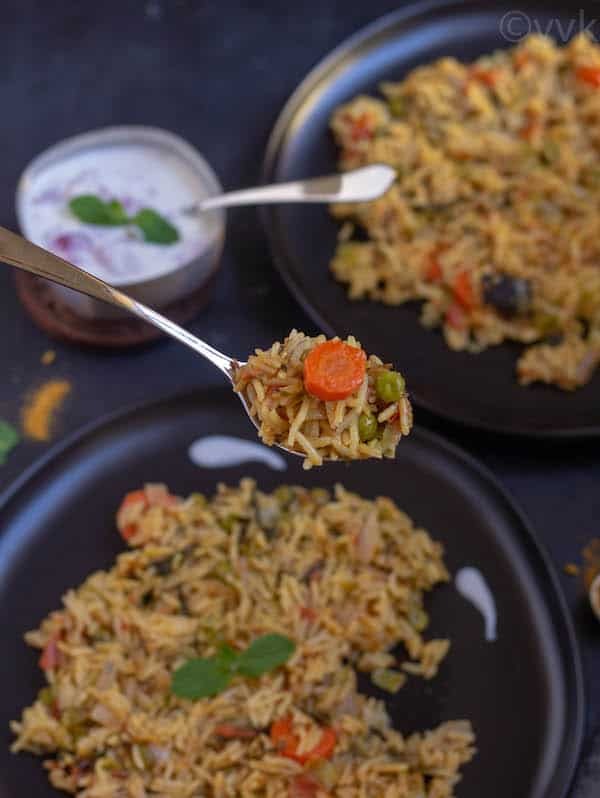 PS: If you try this pressure cooker Delhi Veg biryani recipe, don’t forget to comment and rate the recipe. Also, follow my YouTube Channel for new video recipes. 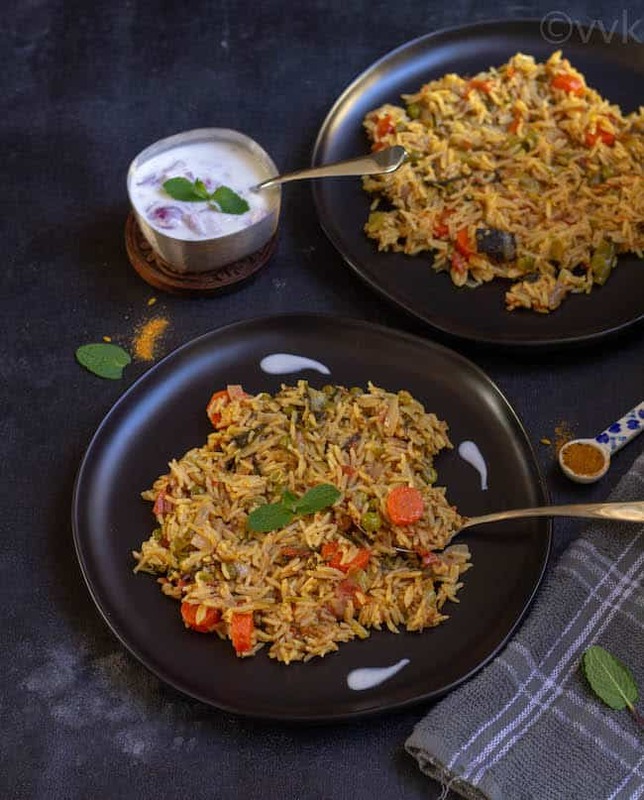 Delhi Veg Biryani - The vegetarian version of the famous degi biryani with vegetables and sela basmati rice from the capital city of India - Delhi. 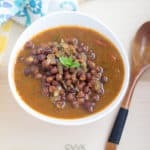 1.5 tsp achari ghost masala I used Shan Brand. 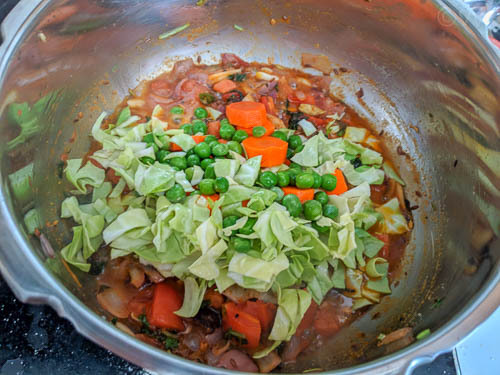 Add all the vegetables - cabbage, carrot, and peas. This biryani is looks so sinful and perfect treat for biryani lovers.. love the click.. flavors and everything. Thanks for share. Pickle Masala would have added a nice flavour definitely to the biryani. Looks so flavourful yummy share!! Pickle Masala would have added a nice flavour defnitely. yummy share!! What a wonderful find! I didn’t know about the part bokled basmati. Will look for it here. The biryani is so unique with the acahri spice and sela basmati. Wow! 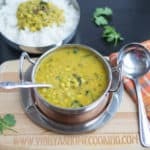 What a unique find, srividhya.I haven’t about the sela rice and sounds very flavorful. I have never tried this biryani before so I have bookmarked this for later! Beautifully presented! Thank you for sharing! I never pay attention towards the biryani masalas in the store aisle and so didn’t know there was a thing called achari ghost masala. The addition of cabbage too sounds unique. This Delhi style biryani is loaded with flavors. Looks perfectly made. Ah yet another interesting biryani you got srividhya. It is frustrating when we dont get much info on some dishes. So many classic ones are lost to us. The recipe sounds very good with use of all that masala. Very nice pick. Totally agree on Valli. Hope we can revive some of the traditional recipes. Wow looks awesome Vidhya. I have some this too but with meat, will be posting soon. Loved the aachar taste in this biryani. That’s great. Looking forward to see your version. 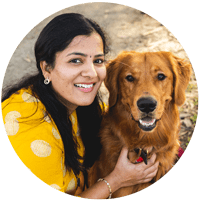 So interesting to read your intros Vidhya. You have done so much research for each dish. Kudos! 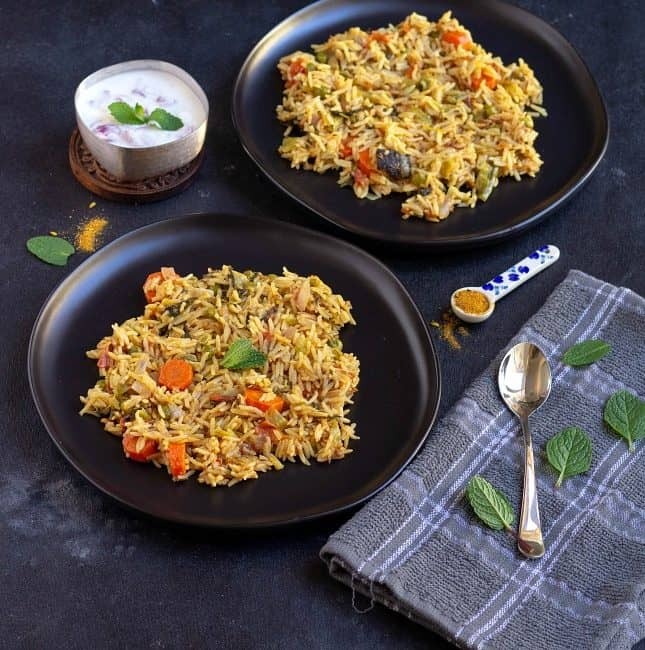 Love the biryani….looks so tempting!! Wow ! A Biryani from my city which is unknown to me ! And it looks super super awesome . Sella rice are very commonly used for all weddings and I learnt this fact from my brother . I had never used them , but you shall see them in one of my posts :)) absolutely love the texture of this rice and this Biryani ! Oh wow, I am surprised it’s new for you too. But I need to agree, I couldn’t find a lot of information about this biryani. Youtube videos helped.